Geist im Glas really is the best of both worlds: a bar at night and a fabulous brunch place on the weekends! 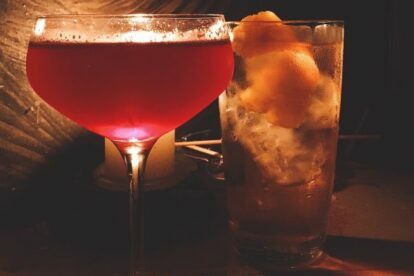 But let’s not get ahead of ourselves: the bar’s specialities are home-made blends and infusions, so I always ask about their newest creations first. When you have chosen what you would like to try (in my case: almost always rum! ), the competent bartenders will quiz you a little more to find out what type of drink suits you best. And that is how you order a cocktail at Geist im Glas! At the weekend, the whole place transforms into one of the best brunch cafés in Berlin. Needless to say, apart from a good coffee, there are also a couple of great drinks to choose from – Bloody Mary, anyone? Their most loved (and most photographed!) dishes are their Huevos Rancheros and their deliciously fluffy pancakes, which are served with their own blend of maple syrup and whiskey. Need I say more? !